Are Los Angeles Solar Panels Right For You? Hugs Construction specializes in green technology and using eco-friendly resources to renovate your Los Angeles home. Lately, we have had an immense rise in requests to install solar panels in our clients’ homes. I find that people usually know that solar panels can save money, but few actually know the details about how solar panels work and if installing solar panels is right for them. In this article, I will try to answer my clients two basic questions: what is solar energy, and how do solar panels work? Solar energy is simply the light and heat from the sun converted into energy to power different systems. “Photovoltaic (PV) devices generate electricity directly from sunlight via an electronic process that occurs naturally in certain types of material, called semiconductors,” according to Solar Energy Industries Association. “Electrons in these materials are freed by solar energy and can be induced to travel through an electrical circuit, powering electrical devices or sending electricity to the grid.” One of the systems that solar energy can be used for is solar panels that can power your home. If you live in Los Angeles or a surrounding area, you have definitely seen your electricity bill go up in recent years as water and power become more and more expensive with depleting resources. Solar energy is a great alternative energy source since the sun’s rays will never deplete and the sun will shine every single day. Solar panels are made out of tiny photovoltaic cells, each of which converts sunlight into electricity. To give the PV cells an electric field, they are usually made of silicon, and sandwiched with other materials, like boron or phosphorous, to create a positive and negative electrical charge, according to Live Science. If you choose to purchase Los Angeles solar panels, you need to know how they will be installed. Prior to purchasing solar panels, you need to check your local zoning board to see if they are allowed, and if you are required to obtain special permits. Since solar panels are installed on the roof, some communities are not allowing them, as they believe them to be an eyesore. Once you make sure that you are allowed to put up Los Angels solar panels, you need to have a specialized contractor provide you with a walkthrough and an estimate. 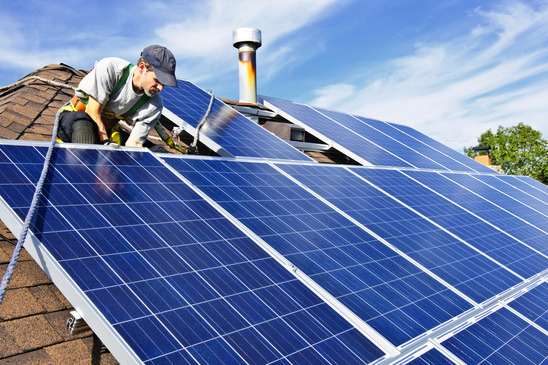 Many solar panel installations require costly structural improvements to the house or building. Solar panels are installed on the sunniest part of your roof. A walkthrough of your property is necessary to see if there are tall, leafy trees which cause shade. If there are, they may need to be trimmed or cut down. You will need to figure out your ideal latitude tilt based on your geographical location, and then mount the system on rafters on your roof. Finally, you need to connect the solar panels to an electrical supply. Are Los Angeles Solar Panels Right For Me? While solar panels save money over time, one of the biggest reasons individuals don’t convert to solar energy is the initial cost to purchase and install them. Solar panels can cost about $4,500-$12,000, plus other parts that you may need. Furthermore, you need to pay a professional Los Angeles solar panel installer to put them in for you. Whether you can afford to put in solar panels, or if you don’t think they are right for you, solar energy is exploding in today’s market. More and more energy systems are being powered by the sun as the newest renewable energy source. Hugs Construction has over 20 years of experience and is a full service construction company in the San Fernando Valley and surrounding Los Angeles area. We work on projects of all sizes, such as installing solar panels, kitchen and bath remodeling, wiring and electric work, soundproofing, installing windows and doors, specialty projects and new constructions. To get a quote for your Los Angeles solar panels, contact us.